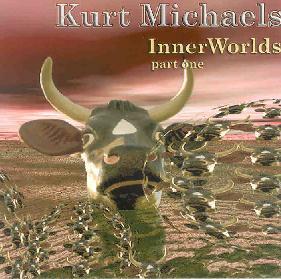 Kurt Michaels - "Inner Worlds - part one"
Chicago based Kurt Michaels first came to my attention when we both joined the recently formed Ambient Space discussion group at Yahoo. And while the music on Inner Worlds certainly includes strong ambient elements, to classify this as an ambient album wouldn't begin to do it justice. Reading the bio on Kurt's web site it seems that he has been a musician for 35 years and has shared stages with the likes of Chuck Berry, Spencer Davis, Wolfman Jack, Badfinger, Bobby Vinton, the Marvelletes, and the Chiffons. Very interesting, and on that note I'll jump into the music. The set opens with "Heaven? ", which at nearly 15 minutes is by far the longest track on the CD and carried me away on a wave of tonal bliss. The careful attention to sound on this recording is key to its success. I could really "feel" the ambient sound waves continually morphing and transforming. You know that magical sound when a wet finger moves along the rim of a glass in an acoustically perfect environment? Yeah, it's like that. Bits of water dripping intermittently throughout the track make a strong but subtle point. Those are the kinds of effects Kurt achieves. The song title asks the question whether this is heaven or not, and the liner notes indicate that it ultimately is not. I recently watched the movie The Abyss (for the zillionth time) and "Heaven?" brought to mind the scene near the end where Ed Harris is at the bottom of the ocean and is fading... close to death... and all of sudden the wondrous alien world that exists down there appears before his eyes. "Nightmare Crossing Over" is next and explores different territory, adding a strong tribal rhythmic pulse to the music. I enjoy ambient music but always seem to get more excited about it when there are additional elements thrown in, and percussion seems to give it a welcome kick. We're also treated to a horn sound that adds a slight Middle Eastern touch. Lots happening here and I was surprised and disappointed when it ended just as it seemed to be developing so nicely. The aptly titled "Alien Presence" is an even shorter track, but this time succeeds in making its statement in the allotted time. I was particularly interested in "The Village" after reading on Kurt's web site that it was inspired by the 60's television series The Prisoner, probably one of the most creative and surreal shows ever shown on American network television. It's got a great mixture of ambient and orchestral elements. And the wild combination of whimsical marching band tune and dark rushing sound waves does indeed invoke the spirit of the show. The last few tracks introduce Rock elements to the proceedings. "You Don't Say" is a short tune with searing guitar lines leading the way. The guitar is front and center again on "Inner Worlds", though it's a more melodic sound than on the more aggressive "You Don't Say". But things get interesting when the melodic guitar is joined by a spacey looped guitar, all backed by haunting atmospherics. Soon a nice groove develops and it takes off into a killer freakout bit. An excellent mixture of ambience, sound exploration, rock, and psychedelia, with an avant-garde edge. "Nervous Barnyard" closes the set and takes the strangeness of "Inner World" in a new direction. The music includes both jazz and freaked out rock, but all within a larger tripped out stew of atmospherics and oddball effects. "Revolution #9" for the prog-space avant-garde. In summary, this is an impressive and varied set that has grown on me over several spins. As this is titled Inner Worlds - part one I'll be waiting impatiently for part two. Highly recommended. For more information you can visit the Kurt Michaels web site at: http://www.kurtmichaels.com. Contact via snail mail c/o Eitux Records; PO Box 2682; Country Club Hills, IL 60478.